The Clear and Simple Stamps team and a bunch of friends are joining together to celebrate a very special day--Reenee’s birthday. Reenee’s half of the amazing mother-daughter team behind CSS and I’m thrilled to be part of the group wishing her a wonderful birthday. If you have arrived at my blog from Regina Mangum’s blog you are in the right place. If you are visiting with me first then you will want to start this special birthday blog hop from the beginning at the Clear and Simple Stamps blog. It wouldn’t be a birthday without presents, so two blog hoppers will receive a package of Reenee’s favorite CSS products (valued at $50). To qualify for the prize, you’ll need to leave a birthday wish for Reenee on the CSS Facebook page and/or the Clear and Simple Stamps birthday blog hop post. One winner will be selected from each spot. And, CSS is offering a one day 15% discount for your CSS purchases. Enter the code birthday15 to receive the discount (not valid with other offers) on your order today only. Here's my birthday card for Reenee. I created a fun, fashion inspired card with lots of texture. The image and sentiment are from the new Just My Style stamp set. I colored the image with Copic markers and added a tiny crystal to the shoe for just a touch of shimmer. The image is layered on a panel of Brown Leather Satchel cardstock and accented with a strip of Dare to Be a Diva Red satin ribbon and a little paper piercing, too. I set the panel on some pretty flocked paper I’ve had in my stash for ages. It’s got such an elegant look and I love the texture it adds to the card. I added a solid red panel along the bottom for a little contrast. Now, head off to the final stop on the hop, the CSS Facebook page. Be sure to leave a comment to be entered to win one of the prize packages. Here’s the list of all of the participating blog hoppers—what a fabulous group! Love this card and the shoe. Lori, this is SO cute! Great card. Love that flocked paper and the gemstone on the shoe. Cute! So cute Lori! Love the color combo you used and that big bow. 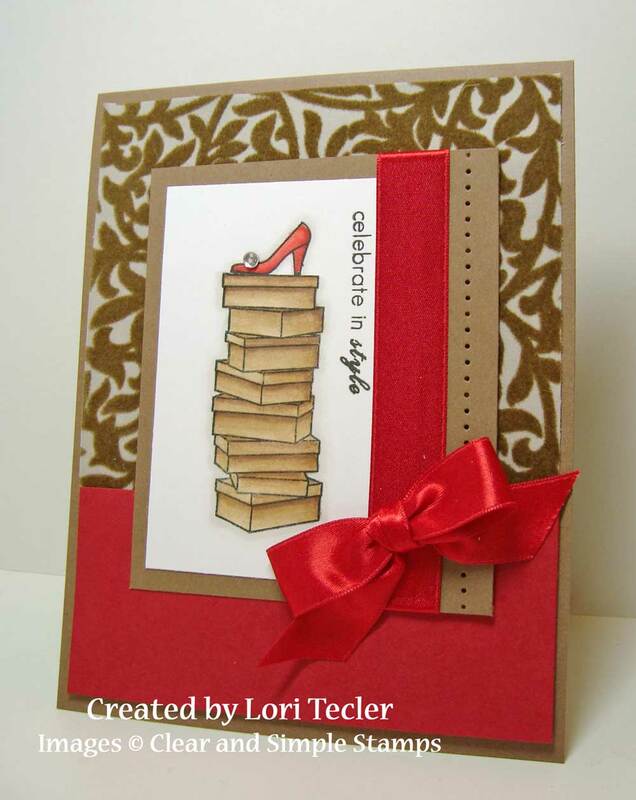 Love the card and what a cute shoe! fabulous paper you paired that image with, love how stylish it is! omygoodness! This card is so cool....very fashionable! This card is too cute! I love the colors and that pretty bow.